It is had to believe that back to school time is upon us already. For us, the first day of school is August 27 and it is a very big day since our twins will be starting Full Day Kindergarten! To say that I am really excited about this is an understatement. This mama will be dancing in the street once the bus pulls away! My go-to store for back to school shopping supplies is Target. Oh who am I kidding, Target is pretty much my go-to store for everything. We are fortunate that our schools don't require us to purchase a lot of supplies, but I do like to stock up on new crayons and such every year. "This back-to-school season will be as easy as 1-2-3 with a little help from General Mills, Crayola, and Target, the one-stop-shop for all your back-to-school needs! Head to the front of the class and check out www.GrocerySavvy.com where you’ll find even more coupons for back-to-school, recipes, and a special 2012 “Grocery Savvy Crayola® Back To School” Sweepstakes!" This is a perfect promotion for my family because as I mentioned I need to stock up on some crayons and we just ran out of Honey Nut Cheerios (my boys are very upset with me about that). How do you plan to take advantage of this special promotion to tackle back-to-school shopping this year? 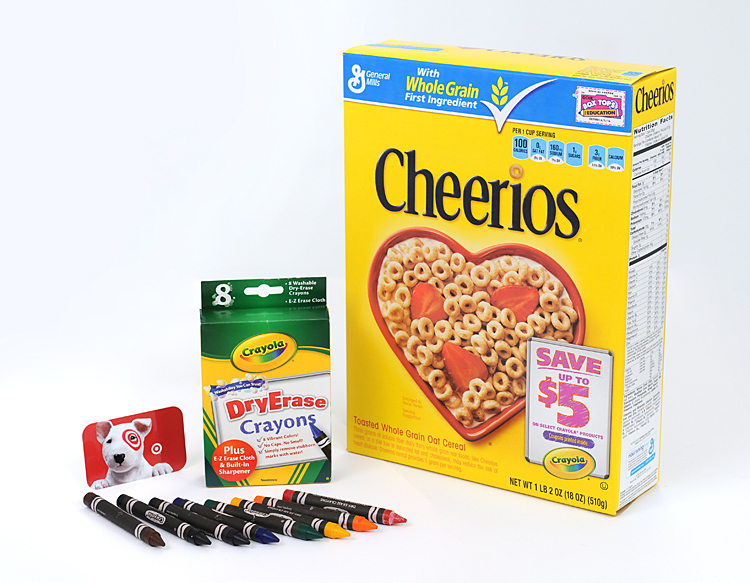 The product, gift pack, information, and additional sample have been provided by Crayola, Target, and General Mills through MyBlogSpark. I received free product to review. All thoughts and opinions are my own. we need to buy crayons and colored pencils. I need to buy coloring pencils. I need to buy crayons. I like the old 64 ct box of crayons. Crayons were not on our list, but I love using the washable crayons at home. This is great! and I love the crayons...we have not tried those yet. I have 2 boys who love to color and draw. We will need to get crayons for the twins. Crayons, colored pencils and markers! I need to buy crayons and colored pencils. We always buy Crayola crayons! I need to buy the standard box of crayons. I need to get Crayola crayons for my kids! I need to buy their crayons & markers. We need to buy crayola coloring pencils and markers. I need to buy crayons, color pencils and markers. I need blunt scissors and colored pencils. We always buy Crayola colored pencils for back to school. They are the best! I have to get Crayola washable markers for my son. just crayons this year! thanks!!! I need to get crayons. I need to get colored pencils. Crayons, markers, colored pencils, scissors! Markers first of all and then crayons. We need to buy crayons and washable markers. Crayola washable markers are the best, will need those for the preschool classroom! Sadly we're all done with school here but I plan on buying and donating school supplies - I miss back-to-school time. Still need colored pencils. Thanks! I don't need any Crayola products for back-to-school. I have to buy 4 packs of Crayola crayons. My nephew needs markers and crayons. Right now I am OK. Need gluten-free food to go. We need to get crayons. We need to buy the colored markers - thank you. I need to buy crayons and markers. My little girl is only 3 so she doesn't need anything for school, but she loves to color and draw, so just about any Crayola product would make her happy. I see that the person just before me in comments said, "washable markers". That sounds pretty good. I have to buy crayons, markers and colored pencils. thank you! We need to buy 8 count crayons for back to school! We need to buy washable markers. Colored pencils are the biggest Crayola products I need to get. Five of my kids need them. Thanks. I bought crayons and colored pencils. Thanks for the giveaway! We need to get some more crayons. I need to get the washable markers! We need colored pencils and markers... we have already gotten the markers! We need crayons, markers, and colored pencils. The big box of crayons! Washable Crayola Markers are a must have. I need to buy markers! Can never have enough skinny markers. I buy markers, color pencils, and just regular crayons. I need to buy some colored pencils. I need to get crayons and markers. I need to buy some crayons. We need to buy a 16 pack of crayons. We need some dry erase items, markers and the new crayons. Thanks!! We need some dry erase crayons and lots of colored pencils! My daughter needed crayons for school. I need to get a standard pack of crayons...ours are down to nubs! We grabbed some Crayola crayons, markers, and colored pencils. There was no back to school shopping here but I've been eying the Princess Light Up Tracing Desk as a gift to my friend's daughter. Markers. Thanks for the giveaway. I need to buy Crayola colored pencils and markers. we bought colored pencils, crayons and washable markers. All Crayola of course. We go through chalk like wildfire in our house! Thanks for the chance at winning. We are in need of Crayola colored markers and Crayola crayons! Colored pencils and washable markers for sure! I need colored pencils,crayons,and markers.I only buy crayola brand crayons. We typically need markers, crayons, and colored pencils! I need markers and colored pencils. Definitely need to get some more crayons! 4 boxes of 24 ct crayons needed for first grade. My daughter likes to have the coloring pencils for school. Crayons, markers and colored pencils. I plan to buy crayons and pencils. We need crayons, washable markers, and colored pencils.